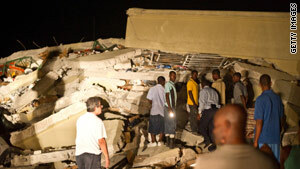 Regine Madhere reportedly has been texting from beneath a collapsed market in Port-au-Prince. (CNN) -- Jacques Bazin didn't have time to catch his breath after being pulled from the rubble of a three-bedroom home on the outskirts of the Haitian capital. Though he'd been trapped in the house for three days, he marshaled the strength to begin helping the Haitians who had just rescued him search for other survivors. He spoke to CNN on Friday, two hours after being rescued, and again Saturday as he worked to free 10 children still encased in the toppled residence. "Next time you call, God willing, they might be out. Otherwise, they will die," he said. "Their voices are really low because for four days, they eat nothing. I drill holes on top of the cement and put bread inside so they can eat. What we do, we have to do fast." Friday evening made his mission more urgent as two children were killed when an aftershock -- one of four that day, all 4.6 magnitude or higher -- disrupted the concrete slabs imprisoning them, he said. A New York-based philanthropist, Bazin, 54, has been in Haiti since December 13. His nonprofit organization, JB Humanitarian, builds schools for the poor in Haiti. Six staff members of one of his schools, in Ocadet, died when the 7.0-magnitude quake struck Tuesday, causing the school to collapse on top of them. Bazin was on the porch of a nearby home taking pictures of the mountains. Twenty-four children were inside the home, he said. "The next thing I know, this thing is splitting in half -- the mountain split in half," he said. "The house where I was went down." He and 12 of the children had been freed as of Saturday morning, but the remaining children were in the back of the house when the earthquake hit. Bazin said he and 11 others were working to free them in one of the poorest sections of Port-au-Prince. Bazin's dilemma was one of myriad stories of lost loved ones pouring into CNN this week via its tip lines and iReport.com. Other pleas for help have reportedly come from within the rubble of collapsed buildings. Regine Madhere is one such case. The 26-year-old worked in the pharmacy of a four-story Caribbean market leveled by the temblor. Stateside friends and relatives in Port-au-Prince told CNN that Madhere had been sending texts to relatives and to a local radio station this week. Reached Saturday in Port-au-Prince, Madhere's aunt and uncle said an American rescue team had been working through the night to rescue those trapped in the market's ruins. "Nobody give a damn because these people are so poor. ... This is the last place they would ever think of coming." Her uncle, Guy Gelin, further said he had seen the rescuers free six to eight people Friday and he was hopeful that Madhere would be free by day's end. With a dearth of resources and rescuers in Haiti, victims are reaching out to locales as faraway as Florida, New York, even Germany. The long-distance text messages serve as a sign of the fear and desperation many are experiencing in the Western Hemisphere's most-impoverished nation. Bazin said his own anguish is confounded by doubts that rescuers will reach his school in Ocadet anytime soon. "Nobody give a damn because these people are so poor," he said. "This is the last place they would ever think of coming." He planned to head into the city later Saturday, he said, to find more food for the trapped children. He said he also hoped to rent a tractor to move some of the larger chunks of concrete enveloping the students. "I have to get them out before I get back to the States. I cannot just leave them like that," he said.